Technical issues make releasing a demo difficult, says the publisher's head of marketing. Rage - the post-apocalyptic shooter from Doom and Quake creators, id Software - is coming in September, but if you were hoping that you might be able to try it out before you shelled out sixty bucks, then you're probably in for some disappointment. Bethesda acquired the rights to publish Rage from EA in December 2009, a few months after it purchased id itself, and according the company's PR boss, Pete Hines, a demo is unlikely. 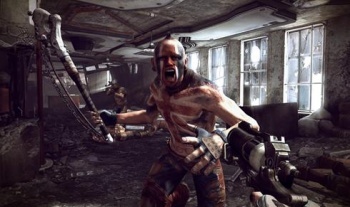 Hines said that Bethesda looked at each every game it published to determine whether a demo was possible and appropriate, and had determined that technical issues meant that it probably wouldn't be feasible for Rage. "I guess it's not a zero percent chance," he said. "But it's somewhere down on that end of the spectrum." Back in 2009, id CEO Todd Hollenshead said that a demo could happen, but that nothing was set in stone, because at that point it wasn't clear what the development cycle would be like. Even at that early juncture, however, he was able to say that an open beta for the game's multiplayer was unlikely. Obviously, this is quite disappointing, but there are already a lot of videos and previews for the game floating around, not to mention the iPhone rail shooter that came out last year. Rage may suffer a little, due to being a new IP, but a demo is only a small part of how a publisher gets people excited about a game. Rage comes out for PC, PS3 and Xbox 360 on September 13th.